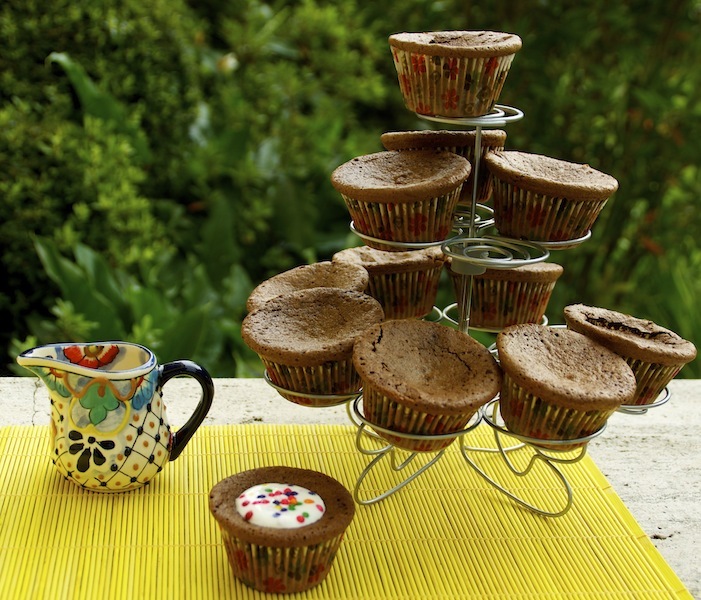 Chocolate brownies in the shape of muffins, what’s not to like? Since my daughter started school this year she has been sick a lot. New germs to deal with, they say it takes at least two months for the body to adapt. She loves when I bake what she calls the “little cakes” and if chocolate is one of the ingredients I always get a big smile (just like daddy). So to cheer her up I decided to try these chocolate brownie muffins. Loved the simplicity and the fact that I don’t need to cut them in squares when ready. Due to the moistness and consistency of brownies, the muffins will sink in a bit in the middle when they are out of the oven. This is normal so no worries. You can accompany them with yogurt and berries. I let my daughter decorate them. After the first bite, she said she was already feeling much better! Preheat the oven to 180ºC/350ºF. 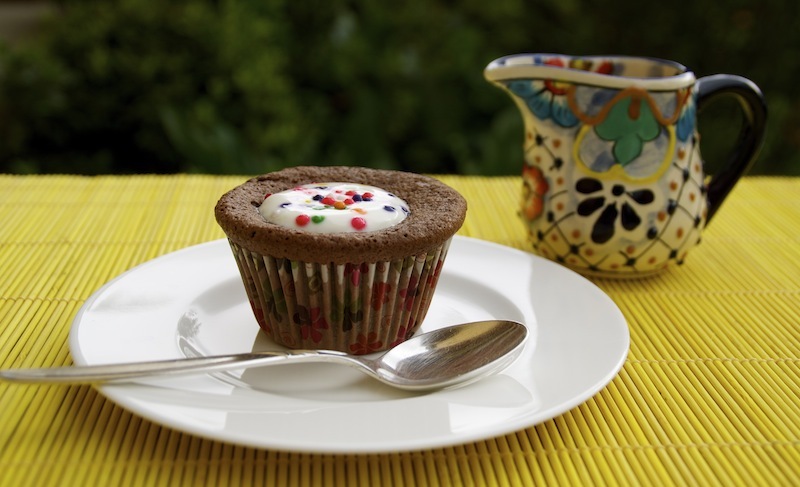 Line a muffin baking pan with paper cups. Break the chocolate into pieces and melt it in a heatproof bowl over a pan of simmering water. Add the butter to the chocolate and stir well until smooth and creamy. Remove and let it cool down a bit. In an electrical mixer, beat the eggs until they start getting foamy. Add the sugar and beat until you get a thick and pale mixture. Pour in the chocolate batter and vanilla and fold in gently. Sift over the flour, baking powder and cocoa and fold in. Pour the batter into the moulds and bake for 10 to 12 minutes. Serve them with natural yogurt and accompanied by berries to taste. Enjoy! Chance had it that this is going to be my 100 post! Like the brownies it has been a sweet, if at times bumpy, journey. I write about what I love, be it my favourite recipes and gastronomical discoveries during my years abroad. About my trips, my love for traditional markets and in particular about what touches me. I also write for my daughter who one day will have a clearer picture of the life we led abroad and the memories we are collecting on the way. I am very proud of what I have achieved so far, it is honest and has come from my heart.